Checking in on the blog stats from time to time, I’ve noticed that there is a crazy high interest in bicycle frame building. My earlier post on a bicycle framebuilding class that I had taken quickly became the most popular post on my blog, so I thought I should share some of the information I’ve collected in the year since. Just Googling “bicycle framebuilding” will give you hours of reading material. Lurking in the forums, you’ll find that a lot of the big names in the handmade bicycle world are very active online. Here are some of my favorite places to hang out online. Velocipede Salon is run by one of the more authoritative figures online and in the framebuilding scene, Richard Sachs. It’s a very active forum and you have to love the Smoked Out section where builders in the industry take the hot seat. In addition to the ever growing knowledge base of the forum, another gem is Friday Night Lights where builders near and far show what they have going on every week. Frameforum was a really active website where a lot of really recognizable names came to hang out online and share information. Unfortunately, the site’s admin closed down the site to further posts because of the overwhelming influx of newbies. All the content is still searchable and the information is really extensive, so I highly suggest trying to seek your answers here. Bike Forums also has a really great section devoted to framebuilders. I don’t think you’ll find as many pro builders fielding questions here, but it’s still a great resource none the less. phred.org is a mailing list crawling with industry pros. The site design looks like it’s straight out of the early internet days, but the content is very rich. Update: Moved to Google Groups. In terms of reading material that’s actually printed on paper, you’ll probably come across the following books. The Paterek Manual is considered by many the Holy Bible of bicycle framebuilding. Tim Paterek offers a free download of his older manual. I’ve only read his free version, but it’s one of the most comprehensive resources I’ve seen on the subject. I’m torn whether I want to purchase his updated book or one of his instructional DVDs. Lugged Bicycle Construction is a very inexpensive book on the subject. I purchased it and probably read it all the day it arrived. I’d give it a rating of so-so. For the price, it’s probably worth it, but honestly I’d save the money for the Paterek route. Henry James is a supplier of framebuilding tools, frame jigs, tubes, lugs, brazing supply, etc. Nova Cycles is a supplier of mainly tubes and lugs. They don’t have brazing or welding supply. Ceeway is a supplier of framebuilding tools, tubes, and lugs. They ship from the U.K., but I’ve heard that depending on the exchange rate you can still get some good deals. UBI in addition to offering the most popular framebuilding courses in the country sells tools, tubing, lugs, etc. I believe they’re the place to go for Kaisei tubing. Bringheli sells a very affordable frame jig and tools that you’ll see in a lot of people’s shops. This is the only one I have had experience with and I thought it was pretty nice, but I would definitely like to get my hands on some others to compare. You can also get tubing and lugs from Bringheli. Anvil Bikes sells what many builders consider the gold standard of bicycle frame jigs and tools. Their tools are muy elegante and muy expensive. Sputnik Tool sells mitering fixtures, braze on tools, and a jig. Nice looking stuff as well. Arctos Jigs is the jig that I used at the UBI Portland framebuilding class for making a fillet brazed frame. It’s made from aluminum extrusion and did a pretty fine job in my opinion. Cycle Design USA, Freddy Parr‘s company, is another good resource in terms of brazing supply. 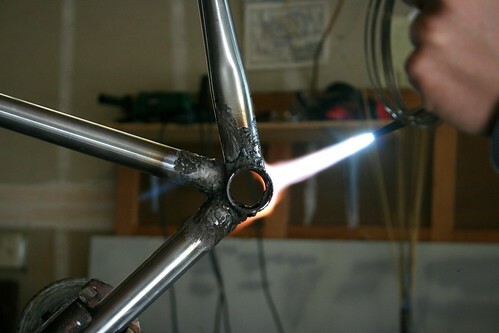 Brazing seems to be a craft that’s popular in handmade bicycles, but not a whole lot else. I’ve spent some time at Airgas and Praxair trying to find brazing rods and flux and the selection is not so good. Aircraft Spruce isn’t a bicycle specific supplier, but they are a good place to get some chromoly straight gauge tubing for rack building or practice pieces. Wicks Aircraft Suply is also a aircraft supply shop like Aircraft Spruce and a good supplier for chromoly straight gauge tubing. I’ve been told shipping is better with Wicks if you are putting in a smaller order. Tube Service is another non-bicycle specific supplier of tubing. It might be worth a look for getting some straight gauge tubing as well. McMaster-Carr is a great online resource for tools. I’ve found not so easy to find nut sizes, granite surface plate cleaner, hacksaws, files, etc. Some items can be tough to find, but this place seems to have all the angles covered. Depending on the style of construction you are interested in pursuing (lugged, fillet, or TIG) you will probably want to research the different courses and see which instructor caters best to your interests. UBI is synonymous with bicycle framebuilding courses and offers classes in Ashland, CA and Portland, OR. I would love to spend a couple of weeks up in Portland soaking in the bicycle culture, rubbing elbows with some of the local talent, and honing my skills. Yamaguchi has a pretty impressive resume. I’ve heard second (or third) hand that he has a very zen like approach to teaching students how to braze. Bohemian Bicycles teaches out of Tucson, AZ. Dave Bohm has a background as a silversmith and artist and it really shows in the quality of the bicycles he produces and how nice his students’ frame comes out. Doug Fattic teaches out of Niles, MI. I don’t believe he advertises his classes because they fill up so quickly, but I believe you can call him directly to see what his openings are like. There’s a YouTube video you can watch highlighting some of his students at work. Brew Bikes teaches out of Boone, NC. This class also offers you the chance to powder coat your frame which is a nice touch. Steve Garn has a background in motorcycle racing and fabrication as well as bicycle framebuilding. Bilenky Cycle Works teaches out of Philadelphia, PA. Stephen Bilenky is legendary for his fillet brazing and tandems. He might also have the wisest beard in all of cycling. geekhouse bikes teaches out of Boston, MA. Marty Walsh apprenticed with Mike Flanigan of Alternative Needs Transportation and makes some of the most radical looking fixed, road, and cross bikes on the road. Bicycle framebuilding is not intuitive. What seems fairly simple in nature becomes ever so much more complicated the further you dig. I’ve been incredibly eager to make my second frame since taking a framebuilding class last year and it has led me down a rabbit hole. I’ve taken a welding/brazing course at the local community college last semester and am currently taking a machine shop course so I can make some simple tools (both of which I highly recommend). Not to mention, I’ve spend a lot of money on tools that I anticipate using during the framebuilding process. But what’s a man without his tools, right? There are some great community oriented shops in the Bay Area like TechShop and The Crucible that will give you access to some of the tools that you probably don’t want to buy until you try. I would also ask around your local bicycle community. Everyone, and I mean EVERYONE, that I talk to about bicycle framebuilding is interested in it in one way or another. Team up with some people and share the costs of tools, etc. especially if you plan on using them only occasionally. It’ll probably be many years until you feel confident enough to sell one of your creations, so go into it with the intention that it’s an expensive hobby. I hope this information was a bit helpful. I plan on adding more content when I come across it, but if you feel that there’s something I should include, please add it to the comments and I will try to integrate it into this post. Also, whenever I come across an interesting site I bookmark it when it’s related to framebuilding or handmade bicycles.